For the longest time, I’ve been more in love with the idea of dehydrating, than the actual dehydration itself. Removing water from food has long been a method of preservation, and flavour concentration, and all round creative, funky applications. But the actual process of dehydration can take hours, and may or may not require specific uni-tasking machinery that just takes up space in your tiny one-bedroom apartment. So when I read that dehydrating herbs in the microwave was an option, I wanted to see just how practical it was, and whether it was really as it seemed. It seemed pretty straightforward. You place a layer of paper towel on a plate, then your cleaned herb leaves in a single layer, then another sheet of paper towel, and then microwave. Should be too hard right? Well on my first attempt, my microwave-friendly plate (it said so on the instructions) decided to self-destruct. Like, shatter-into-multiple-pieces kind of self destruct. I didn’t really know what happened. I set the microwave to 1 minute on high, then waited 30 seconds with the microwave door open, then another minute on high. And it was the second minute where it decided to all go south. On the upside, though, the mint was as dry as could be, and a beautiful vibrant green colour to boot! This definitely had promise in terms of creating dried herbs that weren’t old and brown-looking. 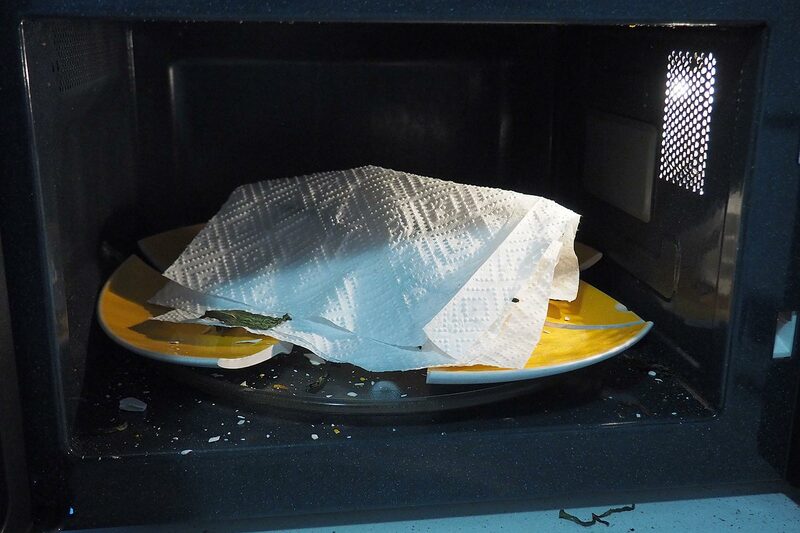 So I tried again, this time laying the paper towel directly onto the rotating glass plate that came with the microwave. Surely you can’t get safer than that, right? Uh, wrong again. I was watching the microwave very closely this time, and checking every 30 seconds if the herbs were completely dry. As expected, the herbs started drying on the outside rim of the plate faster than the centre. We already knew that from microwaving countless plates of rice with cold middles. What I didn’t know was that the dry herbs could, well, burst into flames. Like spontaneously combust with a flash and leave the corner of the paper towel burning like there’s no tomorrow. WHAT IS GOING ON WITH MY MICROWAVE?? I think it was just the result of super dry herbs creating a spark with the super dry paper towel, and set it alight. And it kept happening to varying degrees, too – no matter how many breaks I took between intervals, how low I set my microwave, how short the intervals were…they all had a moment where the corner of the leaf got too dry and decided to ignite. Worse part was, I couldn’t even remove the ring of dried herbs on the outside, because some of these leaves were partially dried, and partially still moist. Fml. So I guess my conclusion is that no matter how awesome the results are, dehydrating herbs in the microwave as it stands isn’t an option for me yet. Between combusting herbs and broken plates, I think I might just keep experimenting till I can figure out a surefire way to preserve the excess herbs that I have on hand. Because my freezer simply cannot hold anymore herbed butter logs. Haven’t tried dehydrating anything… yet 😉 Thanks for sharing this post with us! How very scary! I think it is easier to just invest in a food dehydrator. You can probably find a good one on Amazon or start scouting out Thrift stores for used ones.